Enjoy postcard-perfect views of St. Petersburg, passing river islands, the spire and dome of Peter and Paul Cathedral, and Peter the Great's lush Summer Garden. 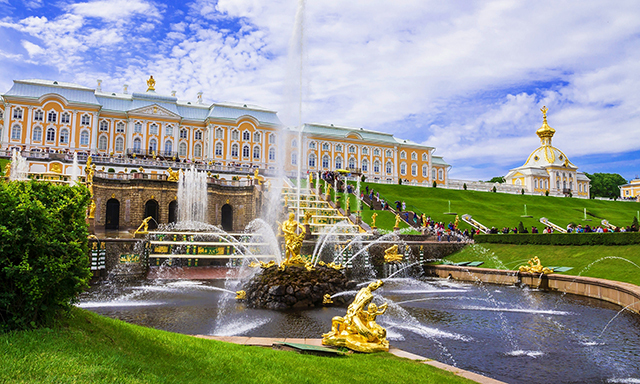 Explore the palaces, fountains, statues and pavilions of Peterhof's Upper and Lower Gardens, and the spectacular fountain network of the Grand Cascade, with its golden statue of Samson opening the jaws of a lion. The tour concludes with a thrilling 30-minute hydrofoil ride from Peterhof back to St. Petersburg. • Hydrofoil: Take an exhilarating 30 minute hydrofoil ride back to St. Petersburg. • Peterhof Park and Gardens: Stroll this 300-acre wonderland's checkerboard terraces, greenery, flowers, sculptures, grottos and palaces. • Grand Cascade: See the world's most incredible aquatic display - an amazing network of terraced fountains gushing to the Baltic. • Guests must consider their physical fitness level and medical history when determining whether this tour is appropriate. Guests with pre-existing neck, back, knee and/or shoulder injuries, cardiac conditions, asthma, diabetes, epilepsy, other heart or respiratory conditions or any other medical condition must take particular caution when selecting a tour - particularly tours categorized as "strenuous". Guests who have concerns must consult with their personal physician before engaging in any activity that may be strenuous for them. • Hydrofoil ride may be cancelled due to weather conditions. Should this happen, the hydrofoil part of the tour will be replaced by sight-seeing coach. • Guests must be able to walk approximately 1 ½ miles over gravel paths, cobblestones and even surfaces, with approximately 200 steps. • No interior visit of Peterhof Palace will be made on this tour. • Peterhof's fountains are subject to maintenance work without advance notification. • Due to the walking involved in this tour, it is not recommended for guests with walkers or wheelchairs. • Tour order may vary due to traffic.